The apostles wanted the same thing many of us desire today. We find in Luke 17:5 that the apostles asked something of Jesus. “Increase our faith.” They felt that if they had more faith, they could do what Jesus did. So they decided to go the easy route and ask Jesus to increase their faith. What better person to ask! Jesus was full of faith – just look at all He did! Nothing – or no one – not even Satan stood in His way. He just spoke a word with such assurance and authority that what He said would be done! Jesus knew what lies Satan told and how he tried to deceive people. Jesus also knew the truth – Satan had no power whatsoever. God backed Jesus up – every time! Now, back to the apostles. When they asked Jesus to increase their faith, His response shocked them. He told them they didn’t need a large amount of faith. A mustard seed size would do! Well OK they thought, Jesus won’t increase our faith. But how do we get mustard seed size faith? I feel positive that many of them went out in the next few days to check out the size of a mustard seed! Take a look at a mustard seed. So tiny, isn’t it? You can barely feel it, it is so small. If you don’t have a mustard seed, then look at a point on the end of a pencil. That’s about the size of a mustard seed. Now, imagine what a mountain looks like. It is Huge! In man’s eyes mustard seed faith could never remove this mountain. But God back’s up His promises to us. God is so simple – He will not make things difficult for us, or make something out of our reach. Matthew 17:20 says, “I tell you the truth, if you have faith as small as a mustard seed, you can say to this mountain, ‘Move from here to there’ and it will move. Nothing will be impossible for you. Mark 9:23 says everything is possible for him who believes. Mark 10:27 says that all things are possible for God. 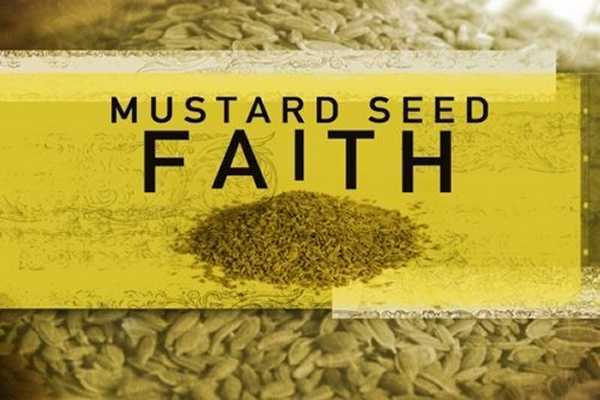 So, how do we obtain Mustard Seed Faith? God gives us the measure of faith (Romans 12:3). OK so now we have mustard size seed faith. What do we do with it? How do we use it? 1. We need to get our minds off ourselves, off the other person, off the situation and focus completely on God. We need to see what Jesus has already done for us by His stripes and the cross, and look to the power of the Holy Spirit. Jesus says trust in Him, He tells us so many times, “I tell you the truth,” He watches over His Word to perform it. 2. Focus on building your own faith. The gift God gives you is enough, but you can build upon what you have. Romans 10:17 says that faith comes by hearing and hearing by the Word of God. God’s Word is Truth; you build your faith by getting the truth into your heart. You can’t read or hear the Word then put it on a bookshelf. What happens when you do that? Well, what happens when you quit exercising and eating too much? You gain weight and loose your muscle. What happens when you don’t focus on giving in your marriage and focus on the getting part? The marriage suffers. What happens when you let you garden go? The weeds come in and overtake the plants. The same thing happens when you stay out of the Word. You forget what the Word says and how to apply it to situations in your life. So by reading the Word of God is how you increase your faith. Keep in the Word, by reading, listening to tapes, listening to others teach and preach until the Word is in your heart and you live, breathe, speak, walk and act on God’s Word at all times. It is not (even remotely) in our own power that any one is healed. We are just a vessel that God can use. If you are a willing vessel then God will use you. Galatians 3:13 says that you and I have been redeemed from the curse of the law. Redeemed means to be bought back. The blood of Jesus did this! Jesus said that He came to destroy the works of the devil, and He did! Jesus or God doesn’t make you sick, that’s one of the (gifts) of the devil! I’d rather have God’s gifts: healing, salvation, redemption, peace and freedom. When you lay hands on people and it doesn’t “seem evident” that you are operating in the gift of healings or miracles, that’s OK. Keep laying hands on people anyway. Mark 16:18 says that if you believe you can lay hands on the sick and the sick will be made well. Healing is a sign following you when you obey God and lay hands on the people. 3. Keep a close fellowship with God. Keep teaching others what God says about healing. Keep combining your faith with the faith of others. Keep doing what God tells you that you can do! Mark 11:23-24 a prayer of faith. Now notice in verse 22 that it says “Have faith in God.” This is where it all begins. The words I want you to focus on here are say, do not doubt, and believe what God says, ask and believe you receive. So when you pray you need to say the Word, talk the Word and act on the Word. Hebrew 11:6 says that without faith it is impossible to please God, because everyone who comes to Him must believe. 2 Cor. 5:7 says that we must live by faith NOT by sight. Seeing can be very deceiving. Keep your eyes on God. 1 John 5:14 says, that we can have confidence, that if we ask anything according to the Word of God then we will receive what we ask. This verse should steer us to the Word to see just what God’s will is concerning healing or anything for that matter. You use the same faith to administer healing as you do when you believe that God created the world. You use the same faith to believe that Jesus is the Son of God and you made a confession that He is your Lord and Savior. You use the same faith to believe that you have received the Holy Spirit when you asked. You use the same faith to believe you have received wisdom when you ask. You use the same faith to believe God hears you when you pray. You use the same faith to believe you are made righteous and justified after you are born again. This same faith comes through you with power and conviction when you lay hands on people and pray for others to receive healing or deliverance. 4. Continue to work by love, develop this love in your life. 1 Cor. 13:2 says that faith has to be proceeded by love. Jesus did all things with love and compassion for others. 1 Thes. 5:8 says to put faith and love on as a breastplate. Faith and love go hand in hand, and protect and shield your heart. Remember, God looks on your heart, your motives. Jesus had mustard seed size faith, because He believed the Father. Jesus is the author and finisher of our faith (Heb. 12:2). He lives in you. Use your faith! So, again I ask you to look at your tiny mustard seed, and see Jesus and the Power of the Holy Spirit working in you and act on this faith and move any mountains standing in your way.